Golden Balls and Duopoly: Shocking or Predictable? Want to see an amazing illustration of how the game theory model of duopoly works? Watch this video from the British TV show Golden Balls. In the classic case of duopoly, two firms (call them Sarah and Steve) produce and sell a good in a single market. Each firm has the choice of charging a high price or a low price. A simple case is shown in the payoff table at the right. If Sarah and Steve cooperate and both charge a high price they split the higher profits. Each gets 50. But if Sarah undercuts Steve and charges a lower price, she will steal all the customers from Steve. She gets 100 and he gets 0 profits. Or Steve might undercut Sarah, and then he gets 100 and she gets 0. If they both charge a lower price, they both lose out. Of course consumers benefit by the low price which is why this is an important economic issue. 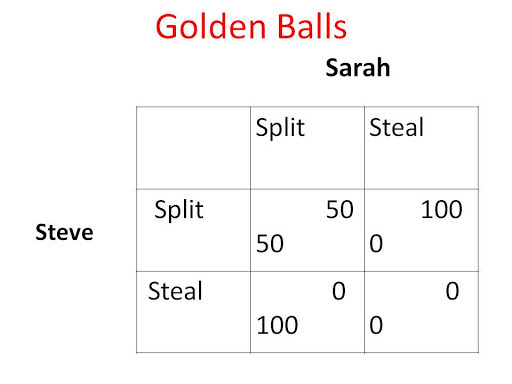 The game of Golden Balls has the exact same structure. I showed this video in lectures today. It was a hit.